Pardon me while I hog this baking dish. No need to stare while I lick my plate AND the baking dish clean. I fall hard for anything Buffalo Chicken – the spices, the creaminess, the delicious. 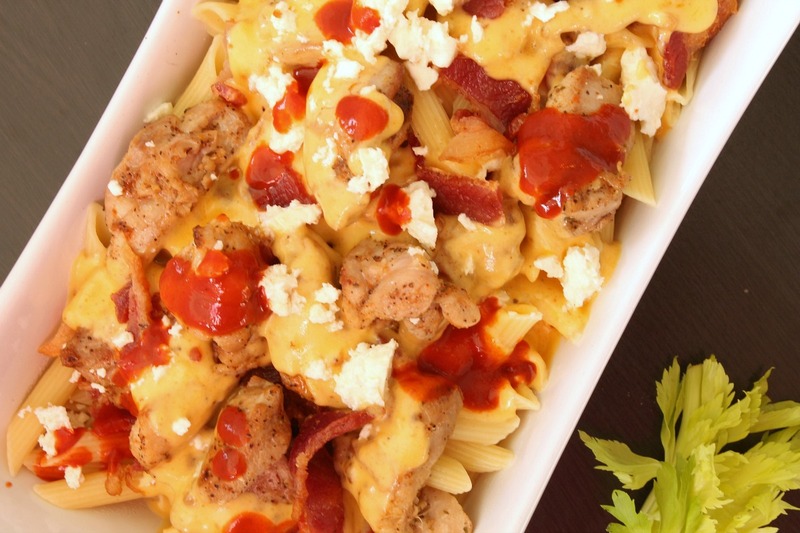 And you’re gonna fall in love with this amazing pasta casserole with all the great flavors of Buffalo Chicken! Get this one added to your next meal plan right away!!! Heat oven to 375 F. Spray a 9×13-inch baking dish with nonstick cooking spray. Cook the penne pasta according to package directions to al dente. Drain. In a small skillet, combine vegetable oil, chicken pieces, and ranch dressing mix. Cook until the chicken is done. Remove the chicken to a small dish and set aside. In the same skillet, add the butter, garlic, and flour. Stir and cook for 1 minute. Add the whipping cream and cheddar cheese and stir until cheese is melted and mixture is bubbly smooth. In the prepared baking dish, place the cooked and drained pasta. Pour the cheese sauce over the pasta. Top with chicken, cooked and diced bacon, feta cheese crumbles, and hot sauce. Bake in the preheated oven for 15 minutes until bubbly. 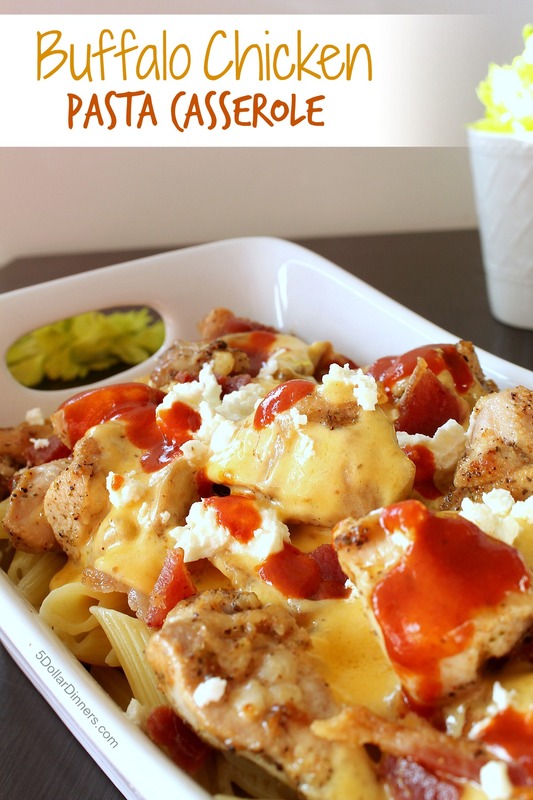 Serve Buffalo Chicken Pasta Casserole, hot from the oven, with side of veggies. This recipe got an “I like it” from my husband which is great! We both agreed that it could have used a little more cheese sauce and a little more kick (wing sauce). However, I did only make a half batch for our first try, so I may have had the balance of sauce and noddles off a bit. We also had a delay of about 45 min before we ate after removing the casserole from the oven, so trying to keep it warm could have been a factor too. I kept the kick to exactly half to determine if my 3 yr old twins could eat it next time. We both agreed that one of the twins (the one who has more tolerance for heat) could have eaten it as long as she didn’t get a direct hit from the wing sauce. I would probably stir it in better for her when served. I left ours in the original drizzle form when we ate it. Will definitely make this one again. We also used chopped chicken breast instead of thighs. That made it a bit drier. Also used fat free half in half instead of whipping cream because that’s what we had on hand. I didn’t notice any difference in consistency from that and love that it’s fat and calories as a result.